Women with polycystic ovary syndrome (PCOS) can add hypertension to the long list of metabolic complications they are at high risk for. Referred to as “the silent killer” for its mostly absent warning signs, hypertension (high blood pressure) is a condition not to be taken lightly. Data obtained from the Dallas Heart Study showed that when women with PCOS were compared to women without the condition, those with PCOS showed a higher prevalence of high blood pressure, regardless of race or ethnicity. 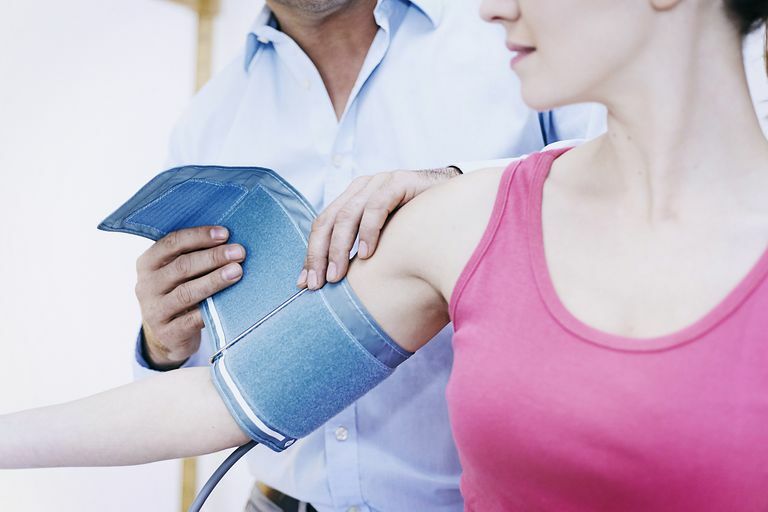 If not controlled, high blood pressure can damage blood vessels and organs. Complications of high blood pressure include vision problems, kidney damage, or even a heart attack or stroke. Knowing and reducing your risk factors (see below), can help you minimize your risk. Blood pressure is measured by using a blood pressure cuff. A trained health care provider will also use a stethoscope to determine two separate blood pressure readings. The first is listening for the “top” number, or systolic. This indicates your heart beating. The second number is the diastolic reading or “bottom number,” which is determining the blood pressure when the heart rests between beats. An electronic device can also be used at home to monitor blood pressure. If the measurement reads 110 systolic and 70 diastolic, you would hear "110 over 70" or write "110/70 mmHg." Blood pressure readings greater than 180/110 are considered a hypertensive crisis, requiring medical treatment. Preventing high blood pressure starts with living a healthy lifestyle. Maintaining your weight, following a healthy diet, and exercising routinely are all actions that you can take now to reduce your chances of having high blood pressure. What you eat plays a significant role in managing your blood pressure. Losing weight, decreasing alcohol and increasing exercise are lifestyle changes that can lower your blood pressure. In addition, here are some changes you can make in your diet to reduce your blood pressure. Most Americans eat way more sodium than what’s recommended. Americans should be eating no more than 1,500 mg a day (that’s just a little over half a teaspoon of salt!) according to the American Heart Association. It’s not unusual for a restaurant meal to contain a days’ worth of sodium. Besides eating out, the main sources of sodium are prepared meals, frozen meals, canned foods, and of course, using the salt shaker. Reading food labels and cooking more meals at home where you control the salt amount can make a difference. Yes, there really is a reason to eat your fruits and vegetables: they help lower blood pressure. Fruits and vegetables contain nutrients such as magnesium, calcium, and potassium, which work to counteract the effects of high sodium in our bodies. The DASH (Dietary Approaches to Stop Hypertension) Diet is proof that fruits and vegetables help to reduce blood pressure in women with PCOS. Women with PCOS who followed the DASH diet saw significant improvements to their blood pressure, as well as abdominal fat loss. Significant improvements in insulin resistance and inflammation markers were also shown. The DASH diet recommends 4 to 5 servings each day of both fruits and vegetables. The DASH diet is plant-based with an emphasis on including 4 to 5 servings a week of a variety of nuts, seeds, and legumes (lentils and peas). Not only do these foods provide a good source of fiber, but also contain magnesium and potassium to lower blood pressure. Omega-3 fatty acids like those found in fatty fish, nuts, avocados, and olive oil have a blood pressure lowering effect. A study published in the American Journal of Hypertension compared a diet of polyphenol-rich olive oil to a diet that didn't contain any polyphenols and their effects on blood pressure in young women. After four months, the olive oil group was linked with decreases in systolic and diastolic blood pressure. If diet and lifestyle interventions are not effective, or if you are still having high blood pressure, your physician can prescribe anti-hypertensive medications to help you control it. Many different types of medications can be used including diuretics, calcium channel blockers, ACE inhibitors, or beta blockers. Diuretics excrete excess salt and water from the body, helping to lower blood pressure. Spironolactone, for example, is a potassium-sparing diuretic commonly used in women with PCOS. Not only can spironolactone lower blood pressure but can also help with the unwanted symptoms of hirsutism such as excessive hair growth and hair loss. Beta blockers work by blocking the adrenaline hormone epinephrine to slow your heart rate. ACE inhibitors relax your blood vessels so the heart doesn’t have to work so hard to pump blood through narrow vessels. Calcium channel blockers lower blood pressure by preventing calcium from entering the heart and narrowing blood vessels, which decreases the amount of force the muscle can generate when contracting. Because you don’t know if you have high blood pressure or not, it’s important that you follow up with your medical provider for checkups throughout the year. Applying the lifestyle tips above can help to prevent and treat high blood pressure. Asemi Z, Esmaillzadeh A. DASH Diet, Insulin Resistance, and Serum hs-CRP in Polycystic Ovary Syndrome: A Randomized Controlled Clinical Trial. Horm Metab Res. 2014. Center for Disease Control. Measuring Blood Pressure. Chang AY, Oshiro J, Ayers C, Auchus RJ.Influence of Race/Ethnicity on Cardiovascular Risk Factors in Polycystic Ovary Syndrome, the Dallas Heart Study. Clin Endocrinol (Oxf). 2016 Jul;85(1):92-9. Moreno-Luna R, Muñoz-Hernandez R, Miranda ML. Olive Oil Polyphenols Decrease Blood Pressure and Improve Endothelial Function in Young Women With Mild Hypertension. Am J Hypertens. 2012 Dec;25(12):1299-304. How Does Vitamin D Impact Blood Pressure? Can Teenagers Have High Blood Pressure? Can Flaxseed Help Lower Your Blood Pressure? How Can Garlic Help Your Blood Pressure and Cardiovascular Health?